On Friday, March 21, 2014, the Annual Lenten Clergy Retreat of the St. John Chrysostom Clergy Brotherhood of Metro Detroit was held at St. Innocent Orthodox Church in Redford, from 10:00 AM until 4:00 PM. 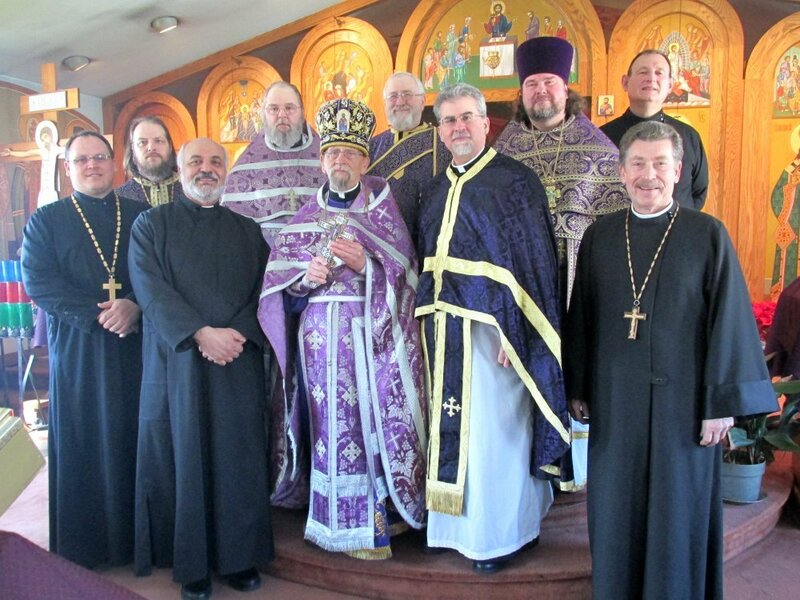 The retreat was hosted by Mitered Archpriest Roman Star, President of the Clergy Brotherhood. The Annual Clergy Retreat is always held at St. Innocent Church on the Friday before the third Sunday of the Great Lenten Fast, the Sunday of the Veneration of the Cross, as a day of spiritual renewal and brotherly fellowship in the middle of the Fast. The Retreat started with the clergy sharing brotherly fellowship in worship by concelebrating the Liturgy of the Presanctified Gifts. Their fellowship continued at a Lenten meal that followed the Liturgy. After the meal, the fellowship expanded more as the ten priests, one deacon, one monastic, and one guest gathered around to join the Retreat Leader, Archpriest Andrew Yavornitzky, in an excellent discussion about “Confession: Some History and Some Current Questions.” Fr. Andrew presented some background about the history of the Sacrament/Mystery of Holy Confession and posed numerous questions about the variations of the Sacrament in practice, historically and today. A lively discussion about various issues concerning this Holy Mystery ensued, with attendees asking and discussing questions in a relaxed environment of fellowship. It is helpful for the clergy to have opportunities to share brotherly fellowship, worship and discussions together in gatherings such as this. The clergy who attended the Retreat are: the host, Mitered Archpriest Roman Star, president of the Clergy Brotherhood, Pastor of St. Innocent Church in Redford, and Dean of the Central States Deanery of the Moscow Patriarchal Parishes; the Retreat Leader, Archpriest Andrew Yavornitzky, Pastor of St. Mark’s OCA Church in Rochester Hills, and Dean of the Michigan Deanery of the OCA; Fr. John Fenton, Pastor of Holy Incarnation Western Rite Antiochian Church in Lincoln Park; Fr. Lev Kopistiansky, Pastor of Holy Trinity OCA Church in Detroit; Fr. Nabil Fino, Pastor of St. Mary’s Antiochian Church in Berkley; Fr. John Wehling, Pastor of Holy Transfiguration OCA Church in Livonia; Fr. Daneil Shirak, Assistant Pastor of St. Innocent Church (Moscow Patriarchal Parishes) in Redford; Fr. 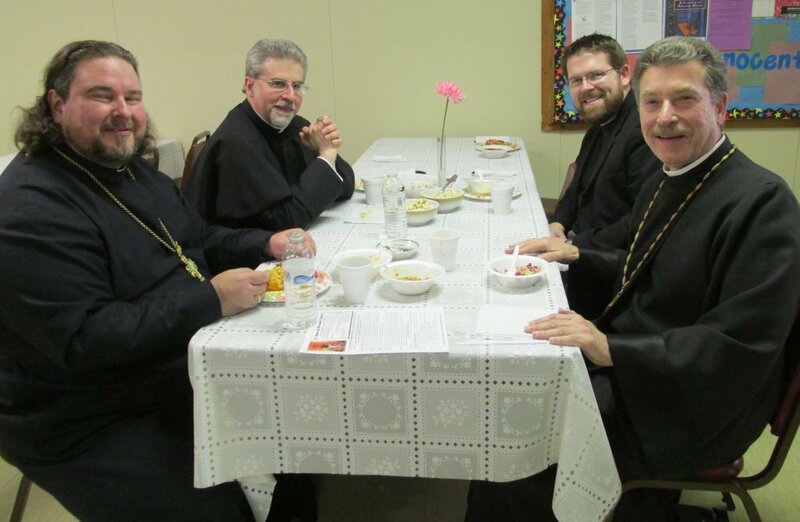 Robert Royer, Pastor of St. Paul’s OCA Cathedral in Dearborn Heights; Archpriest Lawrence Bacik, Pastor of St. Elias Church (Moscow Patriarchal Parishes) in Battle Creek; Archpriest Laurence Lazar, Pastor and Dean of St. George Romanian Cathedral in Southfield, Vice President of the Clergy Brotherhood, and Dean of the Michigan Deanery of the ROEA; Fr. Deacon Basil Frenchek of St. Paul’s Bulgarian (OCA) Cathedral in Dearborn Heights.